1. Cook the garlic in the oil for 1-2 minutes or until soft. Add the curry paste and cover over a low heat for another minute, stirring. 2. 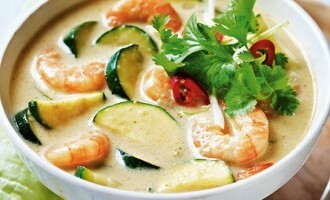 Add the coconut milk, lemongrass, lime zest and juice, Thai fish sauce, soy sauce, sugar and 100ml water, and heat until simmering, stirring often. 3. Halve the courgettes lengthways, cut into slices and add to the pan. Cover and simmer for 5 minutes. 4. Add the prawns and simmer until they turn 5. Transfer to four bowls and garnish with the coriander and chilli. Serve with the rice.